It was a feast of runs at the BRC ground in the Premier league cricket encounter between BRC and Ragama CC where after the completion of the second days play a whopping 673 runs were scored by the two teams. Before going into details the highlight of the second day’s play was a record 309 runs unbroken opening wicket partnership between Ian Daniel and Udara Jayasundara. The massive opening wicket partnership may most probably be the highest ever in Sri Lanka’s domestic cricket tournament which cannot be confirmed. This was after BRC who made 367 with right arm spinner Malinga Bandara ending with an impressive bowling returns of 6 for 90 for Ragama CC. Ian who made 162 in 235 balls with 16 boundaries and three sixes and Udara 139 in 203 balls inclusive of 15 boundaries and two sixes had things their own way as they accumulated their runs with the minimum of fuss. 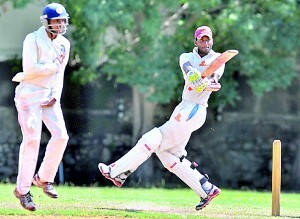 SSC batsmen went on a run riot against neighbours and traditional rivals NCC at their home grounds. Spearheaded by Dimuth Karunaratne and discarded Thilan Samaraweera they amassed a mammoth score of 511 for 7 before declaring. NCC in their turn was 102 for 3. Test discard Samaraweera nudged the selectors with a knock of 111. At Colts ground skipper and spinner Sajeewa Weerakoon led Colts fight back against Moors SC with a five wicket haul. Colts after being bowled out for 149 on day one struck back through Sajeewa to bundle out Moors SC for a paltry 103. Panadura SC has already obtained a first inning lead over Bloomfield at Panadura Esplanade. Panadura SC after being bowled out for 214 struck back to restrict Bloomfield to a low score of 131. Tamil Union too has taken a first inning lead over Galle CC at Galle. 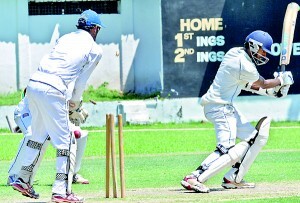 Tamil Union having bowled out the home team for 137 made 226 on day two. Navy SC who were 124 for 5 at the end of the first day’s play went on to make a formidable 358 against Badureliya CC who ended second day on 117 for 5 at the Surrey Village ground in Maggona.